Another shot from MBs recent trip to Canakkale on the Dardanelles Straits in western Turkey. The Suvla Bay area of western Turkey on the Dardanelles Straits is infamous as one of the venues of appalling human butchery of WW1. The battles at Suvla formed part of the Gallipoli Campaign, where approximately 200,000 British/French/Anzac troops died, along with some 60,000 Ottoman Turks. Another 250,00 soldiers from both sides were injured. It is said that the sea was brown in colour for three days following one of the major battles, as the blood of the fallen mixed with the salt water. One hundred and three years later, only a few days back, MB landed at Suvla. It is an altogether more pleasant place today. War monuments and memories abound and MB may return to that subject matter at another time. For the moment, MB will focus on the Suvla vineyard where some mighty fine Suvla wine can be procured. On the lawn outside the main building sits an old stone press which was used for pressing the grapes. Inside, the vineyard shop sells a host of Suvla wines and foods. MB read in the dim and distant past, or heard it from some sage or other, that street performers help lower street crime in the areas in which they operate. MB guesses that street criminals just get chilled out when the hear the music, smoke a joint or a fag (Irish slang for ‘cigarette’), and just go with the normal flow, rather than engaging in their more usual dastardly criminal activity flow, like stealing MB’s camera and such like. MB just looked up the statistics for ‘street buskers help to lower street crime’, and guess what? Google never even heard of the theory, nay, never even heard of the absolute fact. Prompted by that particular piece of ineptitude, MB just looked up the google share price and was not surprised to see that it’s down 3.16 points on the day. No wonder, MB is now thinking, if the googlers (people employed by google) don’t even know that street musicians help to reduce crime, then they don’t know diddly squat. So get your s**t together googlers. Feed your knowledge from MB’s HX blog, and stop the share price rot. MB is just now running off to do a search on Bing and Yahoo and see what they throw up. They can’t be as bad as google, surely. MB came across this guy, playing a tune on board a ferry that was crossing the Bosphorus Straits, on 11 April 2014. How do you know the exact date MB? Just because MB does lads. For sure, MB didn’t find it out on google. And MB can safely report, that there wasn’t a single crime during that 15-minute crossing! Less than 24 hours ago, the bridges over the Bosphorus Straits were closed by Turkish army units who were attempted a coup. The coup failed. For medium-term or longer-term impacts we must wait and see. MB is no fan of Erdogan, but he does not support any coup. On receiving this week’s Photo Challenge from Michelle at the WordPress website, MB started a trawl through his photo library for something suitable. He came across a really nice shot of some street pigeons eating bread crusts on a footpath in front of Lake Geneva in Montreux, Switzerland. It would have got lots of ‘likes’. He came across another cutie shot of a monkey in a forest park in Goa, India, eating a banana while holding her baby. For sure many ‘likes’ would have clocked up. There were many others that would equally have brought smiles to the faces of observers. Then MB came to some pics he took in Istanbul on his last visit to that city in the Spring of 2015. And he saw some pics of Syrian refugees begging on the streets so that they might enjoy some occasional food, ‘dinnertime’ being a long forgotten concept. And but for the generosity of passers-by, which obviously fluctuates up and down, even ‘occasional food’ becomes even more occasional. Turkey has some 2M Syrian war refugees at this stage. The refugee camps are places of horror, and hence many refugees prefer the indignity and awfulness of begging on the streets of the major Turkish cities, in all weather conditions, in preference. The EU has recently promised Turkey some USD 3B to cater more easily with the refugee influx, but more critically from an EU point of view, to stop the refugee tide flowing into Europe from the Turkish mainland. A Turkish friend said to MB recently that we can expect about 10% of the cash to go to the migrants and about 90% to be syphoned off by Prime Minister Erdogan and his cronies. If you know anything of Turkish politics then you will know that such predictions mightn’t be too far off the mark. Incidentally, a Syrian acquaintance of MB’s in Doha, hailed the re-election of Erdogan some months back as “a great day for Islam“. MB nearly wept on hearing. Erdogan wraps himself in the Islamic flag for sure and plays the Islamic card very well. It doesn’t surprise MB one little bit that Erdogan’s major support base comes from the lesser educated sectors of the Turkish population. And so MB comes to the end of his ‘preachy’ introduction to this weeks photo challenge. Please forgive the departure from the more pleasant norm. A little commentary follows on each of the pics. MB is not expecting many likes! The angelic faces of the two babies caught MB’s attention in particular. The shot was taken in the heart of Istanbul’s tourist area, approx 100m from the famous Blue Mosque and other iconic Istanbul attractions. A grotesque contrast if ever MB saw one. This is not a nice photo, in the sense that it doesn’t convey anything nice. In fact it is very un-nice. MB is sure that when this young couple got married only a few years back, the world seemed full of great promise and all things good. Then their country and their region were engulfed in war. MB noticed that the father never lifted his eyes from the downward direction. He would raise his hand to beg money on hearing passers-by get close or on seeing their feet, but the shame of his new found refugee/begger status didn’t allow him to look strangers in the eye. The look on his wife face is even worse, and speaks a thousand words and more of her new-found situation also. To say that she is beginning to look more animal than human is not an exaggeration. What a world we live in. The awful irony of this photo is that the two signs behind this hungry mother and child refugee beggar duo, on a hot Istanbul street, are advertising health supplements in the adjoining shop. The mother has positioned herself and child in the shadow of the tree trunk to avoid the sun’s heat and allow her child to get some easier sleep. She would raise her hand to passers-by for donations. It’s the end of another Middle East week and the Friday/Saturday weekend looms large. Seems like it was only a day or two back when the week actually started. This last one just zipped along for sure. Maybe the older you get the quicker the weeks fly by. The end of your time gets closer and time speeds up it seems. Maybe it’s something to do with Einstein and his waves. Einstein’s always coming up with stuff to explain stuff it seems. When he was alive at least. But back them nobody had a clue what he was on about. Just like now. E=MC2. Ya right. MB wrapped his cold hands ’round a cup of hot coffee. In a cozy coffee shop overlooking Taksim Square. He munched on a slice Turkish cake sitting by a window on the upper floor. There are so many Turkish cakes. And Turkish goodies of so many sorts they are like the stars in the heavens. MB finished his cake and wandered outside, cup in hand. He stood on the narrow balcony to view the sights below. The square spread out from MB’s coffee-drinking vantage point where visitors and locals alike enjoyed the open spaces of the famous square. An elderly lady sells bird seed for peanuts to those who might like to fed the pigeons. In Taksim there are so many pigeons. More pigeons than people. The pigeons enjoy the free food. It’s far better that scavenging for a living like pigeons in other parts of Istanbul. If MB was a Turkish pigeon he would like to live in Taksim. He would not like to live in low pigeon-income locations having to scrimp and scrape day in day out. MB likes to take pics. He didn’t have his camera at Taksim. But he had his iPad-mini gadget and gave it a go. Next week MB will be taking himself to Panjim on the Mandovi river estuary. He will say hello to Vasco De Gama and also get to meet St Francis Xavier in the flesh. Even though SFX died in December 1552. No kidding. 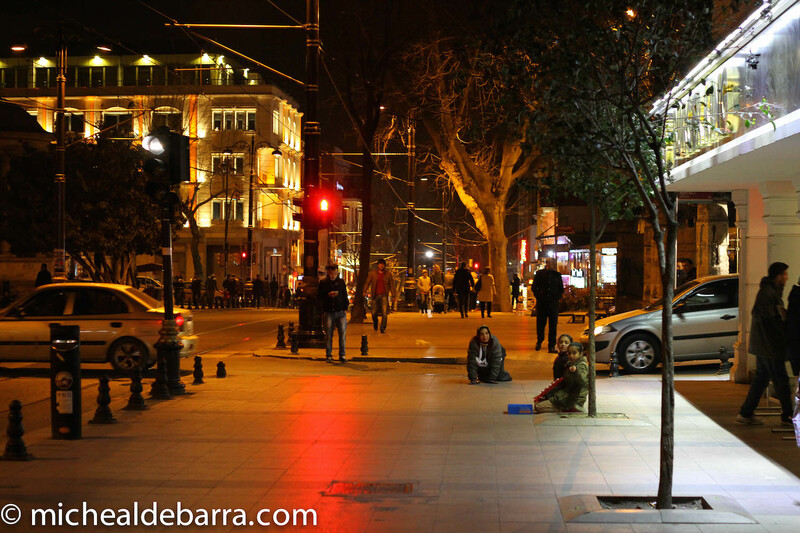 Last night MB watched an elderly Syrian lady cross an Istanbul street on her hands and knees as her two children begged for money nearby in the cold Spring night. Her feet are too sore or too diseased to stand upright. By the end of 2015 Turkey expects to have 1.7M Syrian refugees within its borders who are fleeing the fighting back home, where over a quarter million people are already dead as a result.